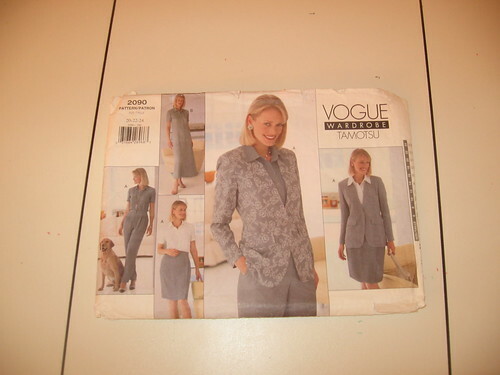 Diary of a Sewing Fanatic: Vogue 2090 - An Oldie but Goodie! Vogue 2090 - An Oldie but Goodie! I'm going way back...I mean way back in the pattern archives using this pattern. I made this third version of the dress in May 2006. Since I've been moving things around due to the great sewing room redo, I've looked at some things that were stashed that I haven't seen in awhile. When I touched this pattern it brought back such pleasant memories, and I've been wanting a summer shirtdress, so I pulled it out. I made my last version of this dress 6/7 years ago. 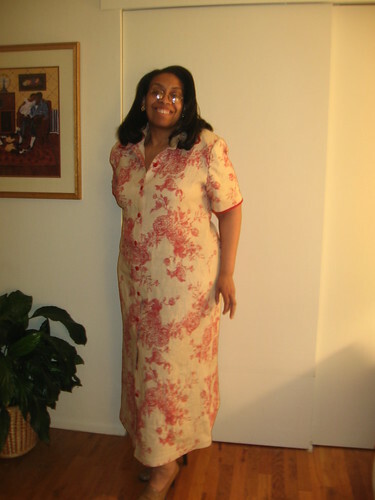 When making it this time, I decided to use my TNT dress pattern to check the fit and to shorten the dress. Alterations were made to the dress using my pattern sandwich method. I shortened the pattern so that it would be knee length. It will also be sleeveless to work with or without a cardigan. The only embellishment will be the buttons and the topstitching. ...but after pondering on it for a week I went with a marine blue linen. I really wanted a colorful dress that would fit with my corporate environment but not stick out like a sore thumb. So I put the green floral linen back on the shelf for another time. The pattern alterations were simple. I used my TNT dress pattern as a basis to make the alterations to Vogue 2090, adding some width to the hips and abdomen and to shorten the dress' hemline. Construction was easy especially since I've made the dress a few times. I added white topstitching to the collar and the front band. The armholes were finished with white bias binding and rayon seam binding was added to the hem. I also made a matching belt trimmed in the white topstitching. 1. The armhole is too large. I was able to take some in on the sides to prevent some of the gaping but it is still to large. It will wear best with a cardigan, not alone, but I don't want the pictures to make it seem as if it's a perfect sew. 2. The buttonhole placement is off. Normally I start with the buttonhole at the center of my bustline and then space the buttonholes from there. I didn't this time and there is a gap at the bustline where the top is pulling. So I added a safety pin for the photos but will be adding a small snap for future wearings. 3. I made a tie to go with the dress. I didn't use it in the photos and I'm not sure that I will wear it at all. Although I liked this dress on the hanger, I'm not sure I like it on me. I will need to wear it to work to see. I wanted to make a ponte knit version of this for the fall but I'm putting it on hold now because I just don't know. Lastly, this is a great picture of my daughter (my photographer) and my granddaughter. Two of my three daughters, grandchildren and significant others came by this weekend to visit. It was nice to have them here but honestly the quiet when they left was just as sweet. may I be the first to say I am in love with this pattern, your gorgeous versions of it and you are looking so well! Way to go Carolyn!! Great summer dress! I think the white top stitching on the blue is a nice touch. I really like the white on blue. I think it's look great with the white cardigan too. This looks really good, Carolyn, but I cannot wait to see it in ponte. I've always loved that original floral tea-dyed dress! Love the combo of the blue with white topstitching. Did you think about adding a bit of elastic thread through the armhole binding to snug it up a bit? Since it's linen you might be able to snug it up and steam some of the fullness out. Love the blue and white - it's always such a fresh combination. I know you 'know' your best skirt lengths, but I think maybe an inch or so shorter on this dress would match the summery vibe better. Just a suggestion. Nice dress. Love the clear colour. Very nice. I like it, especially with the white cardigan. You look so comfortable and chic! The colour and cut suit you (from where I'm looking anyway). The fit is great - especially the back view. I can imagine it with the belt too (or a brown leather one). I wonder what it is that is making you not love it? The armholes? If so, could you wear a white singlet underneath? The flash of white at the neck and armhole would look nice I reckon. love the contrast stitching, very nice. I really like this dress and the white top-stitching sets it off beautifully. You look lovely. Nice dress! Great job with topstitching. It's been my experience that armholes need reshaping when going from set-in sleeves (like your pattern) to sleeveless. This is especially true with large bustlines. All this said, I like your new dress and think you'll enjoy wearing it to the office. The blue dress still looks super cute! I like it, especially with the cardigan. There is something very summery about the color combination. The armholes are an easy fix (on the next one). I really like the collar on you. Maybe it'll morph in the magic closet and feel better on. In the pictures, you look great in it. Love the details. I know you'll make your own decision about this dress, but I thought I should add that the shirt-collar collar is a very flattering neckline on you. It draws the eye to your smile. This dress is a true classic that never goes out of style. After experiencing a bit of disappointment with the fit of some of the patterns I bought lately, I almost prefer updating some of my own old tried and true patterns. You did a wonderful job. And you have a beautiful family. Your granddaughter and daughter are are both stunning. beautiful color and perfect choice for that style. Looks like a great summer dress. thevogue dress would be nice with the jacket in a plain colour , is it pink or red not sure? Love the topstitching on that cool blue, and the placket and buttons down the front is quite slenderizing. I love both versions! The blue one looks really cute with the cardigan. Beautiful family! I think it is very pretty, and you look very nice in it. I think that this dress looks good on you! It has an easy feel to it. This is such a flattering dress! No wonder you hung on to the pattern. I love the blue and white, it's just perfect for summer! I love it! You look fresh and summery and the neckline is super flattering. I wonder how it would look belted with the cardi. I agree with the knitmachinequeen's post about the FBA. That is the only way I can get my armholes to fit correctly. I hope you make this in the Ponte! Sale Alert - One Day Only!